A strike by China Airlines pilots has worsened, with 27 flights being canceled today including eight between Hong Kong and Taiwan as the dispute enters a fourth day. Six flights are between Hong Kong and Taipei - out of a usual 18 - and two between Hong Kong and Kaohsiung. The Taoyuan Pilots Union started the strike at 6 am on Friday, and more than 500 China Airlines pilots of a total strength of 1,367 are now out. Union leaders and airline reps met on Saturday, but the session was inconclusive. There was also a failure by Taiwan transport ministry officials to persuade the two sides to hold more talks yesterday. The union's major demands are for more manpower to prevent pilots from becoming fatigued, a transparent co-pilot training system, guaranteed working rights for pilots, no reprisals for the industrial action, a sacking of management staff it accuses of damaging relations between employees and the company, and a year-end bonus scheme similar to one paid by Taiwan's EVA Air. "We're not sure when will be the next round of negotiations," union chairwoman Lee Hsin-yen said. A main demand, she said, was for China Airlines to have three pilots on flights taking seven hours or more. But the company only agreed to apply this to flights lasting at least eight hours. The seven-hour line was the bottom line, Lee added. There were also reports in Taiwan that the airline assigned cadet pilots to first officer jobs. But the various claims were largely lost on tourists intent on going home from a long Lunar New Year holiday. The Airport Authority said four flights between Hong Kong and Taipei were canceled yesterday. And two flights between Hong Kong and Taipei and two between Hong Kong and Kaohsiung were delayed. Hong Kong Airlines has already laid on six additional flights, including four on Saturday and two yesterday, carrying about 1,500 passengers. At Chek Lap Kok, a Hongkonger named Cheng, who joined a four-day group tour to Taiwan, said she was departing as planned but was worried about her return flight. A visitor from Taiwan named Wang said her flight had not been affected and she was satisfied with China Airlines' arrangements. "I was relieved as it did not cancel or delay my flight," she said. A Hongkonger named Cheung arriving back from Taipei, where he and his family flew last Wednesday, said his return flight yesterday had been canceled. But China Airlines helped him and his family board a Cathay Pacific flight within hours. "It was quite fast to get another flight," he said. Travel Industry Council executive director Alice Chan Cheung Lok-yee said Taiwan is not the most popular destination for Hongkongers during the Lunar New Year holiday, and most people who do go there do so as individual travelers. "The more popular destinations during the New Year are Singapore, Malaysia, Thailand, Japan, Korea and the mainland," Chan said. "On average, less than 10 groups travel to Taiwan each day during the holiday." She added: "It seems Hong Kong travelers are not that seriously affected. There are many flights between Hong Kong and Taipei each day." Meanwhile, the Hong Kong Aircrew Officers Association, representing Cathay Pacific pilots, faces trouble from members, who are dissatisfied with its salary deal with the airline. Its chairman, Darryl Soligo, resigned on Saturday. 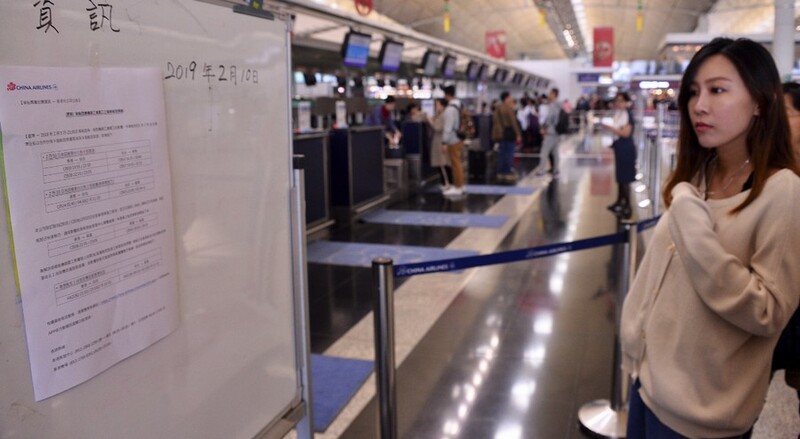 On a broader front, Chief Secretary Matthew Cheung Kin-chung noted yesterday that 3.03 million people went in and out of Hong Kong during the holiday's three days - up 22 percent on last year.